Building on our WordPress base, we are experts with a variety of event management plugins. Whether you’re looking to post your schedule of yoga classes at the neighborhood rec center or run a yearly event with thousands of attendees we have the functionality to make managing the scheduling, tickets, and door checks at your event a breeze. Community Action Initiative came to us to create an integrated WordPress Network of sites. We created a fresh new design for the main site, worked with them to develop a streamlined data architecture, and created a fast, responsive site that is custom built to fit their needs. Their other network sites (Open Answers and Healthy Drinking BC) both run off a custom theme we developed for them that showcases custom built forum functionality. All of the sites on their network give the administrators the ability to manage Events, Training, Resources, and other Custom Post Types. A custom built page builder gives them the ability to create new pages with bright and engaging layouts without suffering the performance hit that out of the box page builders create. Open Answers came to us to create an integrated WordPress Network of sites. Websites in the network include: Community Action Initiative and Healthy Drinking BC. The network of websites run off a custom theme we developed for them that showcases custom built forum functionality. All of the sites on their network give the administrators the ability to manage Events, Training, Resources, and other Custom Post Types. A custom built page builder gives them the ability to create new pages with bright and engaging layouts without suffering the performance hit that out of the box page builders create. 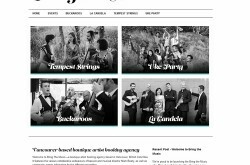 Healthy Drinking BC came to us to create an integrated WordPress Network of sites. Their other website on the network include : Open Answers and Community Action Initiative. Both websites run off a custom theme we developed for them that showcases custom built forum functionality. All of the sites on their network give the administrators the ability to manage Events, Training, Resources, and other Custom Post Types. A custom built page builder gives them the ability to create new pages with bright and engaging layouts without suffering the performance hit that out of the box page builders create. 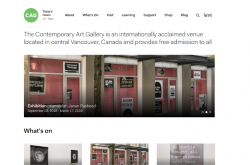 We worked closely with Contemporary Art Gallery to make their redesign a reality. Using a design supplied by CAG we migrated their existing content into a new WordPress install, updating their WooCommerce templates to a current version. Moving to a lightweight minimal custom theme means the site now loads much faster, giving their users a more responsive experience on both mobile and desktop devices. Streamlined custom event management means that users can see what’s on at the gallery at a glance. 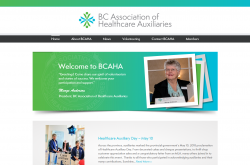 We worked closely with British Columbia Association of Healthcare Auxiliaries (BCAHA) to update their home page on their existing WordPress theme, and migrate their site to our managed hosting. New additions to the home page include a user-friendly capability to feature news and events, automate recent news carousel, and interactive event calendar. The changes to the theme also feature a flexible slideshow and unique BCAHA functionality available to site administrators through custom shortcodes. Our managed hosting means BCAHA gains all the benefits of our suite of security and performance tools, ensuring the site’s security and speed are always first in line. 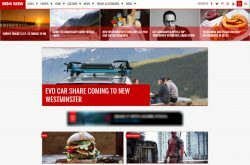 604 Now needed a new theme designed and built to show off their fresh content and to monetize the site effectively with Google Ads. We built them a theme that allows their users to create accounts & save posts and events to their profile, integrated Disqus commenting to increase engagement, and built a custom calendar to showcase events on their site. With a one click approval of events submitted by users, the process of managing the site is streamlined and the fully responsive template means users can access information they need on any device, at any time. Their quickly growing traffic means they need the server capacity to handle articles going viral, and so we’ve installed and integrated Varnish in order to reduce the impact of high traffic on the primary server while still delivering lightning fast content to the user. The Italian Cultural Centre (Il Centro) is a community hub for anyone in Vancouver seeking anything from banquet services to Italian classes. The site presents their range of services clearly, using an integrated WordPress multisite. With a unique dashboard for each department within Il Centro, this site’s user interface is optimized for different tasks, from registration and ticketing to news updates. Sites on the network also take advantage of WooCommerce integration and Il Centro can sell tickets to their events without the overhead of a third party reseller with Event Espresso. Our long term working relationship means we have moved beyond traditional web services and we now also provide and maintain cloud based backup services with redundancy, giving Il Centro confidence in their data storage solutions, and have created 360° Photo Spheres of their rental venues attached to their Google Places listing, and embedded them in the site. The VAM site was designed and built using the WordPress CMS. The fully responsive custom theme features custom fields, multiple custom post types, secure contact forms, and is fully integrated with custom payroll and registration functionality. Our suite of custom plugins for VAM include Custom Faculty Payroll, Student Registration, Year End Controller Reports, and Registrar Management. Our long term working relationship means their site is ready to grow alongside them whenever they require new functionality, and our training and continued support for the staff gives them the confidence to handle this large suite of custom tools. We also actively manage Google Adwords, ensuring that the site is always visible when potential students are searching. As a result of our changes enrollment at VAM has increased 25%. We migrated the Hort Education site from their old, difficult to use CMS to an integrated WordPress network. This allow them to feature content published on any of the other sites on that WordPress network, keeping the home page content fresh. We also did a redesign update on this site, keeping elements of the original design intact and updating it to be fully responsive and display across all devices. The design features slideshows, calendars, and dynamic content. Additional features include: event, job, and applicant registrations, as well as numerous custom post types. We designed and built this lightweight responsive template with an emphasis on flexibility. Stripping down event management to it’s core, we provided a simple solution that fit the requirements of the site, without bogging it down with unnecessary and unwanted plugins and fluff. The theme is responsive both to changing device sizes and flexible content requirements.